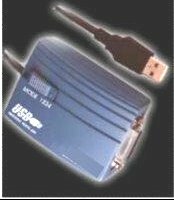 USB to Gameport Converter - Custom Sensors, Inc. The RM-203 is a USB to Gameport Converter. It enables the use of older analog joysticks and game controllers with newer computers having only USB ports. It plugs into the USB connector on your computer, or a USB Hub. The unit has a 15-pin connector, the same as the gameport connector on older PCs. The converter is powered from the USB port. The RM-203 has a 4-mode switch. Mode 1 is used with a type TM-FCS controller. Mode 2 is used with a CH FLIGHTSTICK PRO controller. Mode 3 is used with a 2-4 AXIS 4-BUTTON controller. Mode 4 is used with a 2 AXIS 8-BUTTON controller.